Welcome to the Kintore Arms Hotel. The Hotel is a 15 minute drive from Aberdeen Airport and Aberdeen city centre can be reached in less than 30 minutes. This is a perfect place from which to explore the region’s many sights and attractions. FREE WIFI in public areas and free on site car parking. Unfortunatly the hotel does not have a lift and all bedrooms are above ground level. The Kintore Arms combines comfort and charm with modern convenience. 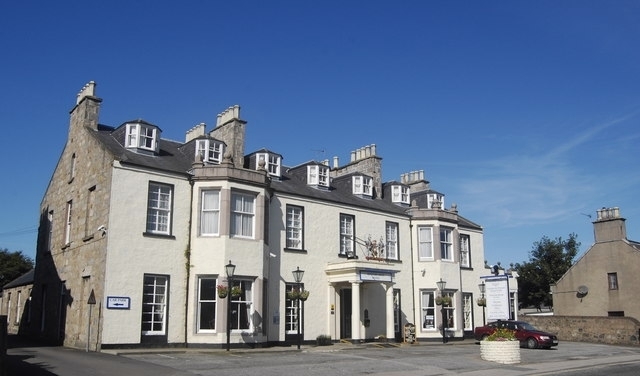 It has 27 beautifully furnished and well-appointed bedrooms including twin rooms, double rooms and family rooms.Situated in the historic town of Inverurie, The Kintore Arms Hotel dates back to 1855, and offers one of the warmest welcomes in Scotland and is still an integral part of the community. The KA as it is affectionately known, boasts a number of public areas for guests and locals alike to frequent, with the traditional Crombie Lounge bar with its own real coal fire. The Cherub's Restaurant at the Kintore Arms Hotel serves dishes based on locally produced and seasonal produce, wherever possible. Early booking for the very popular Sunday Carvery (12pm - 7.30pm) is advisable, while the hearty Scottish breakfast served to guests is always well received. On the banks of the River Don and the River Ury, Inverurie is today a thriving market town with much to offer both the local and the visitor. Quaint shops and ancient buildings, including St Andrew's Parish Church, are complemented by a monthly Farmer's Market selling the finest of local, seasonal produce.